Colton's Map of The World on Mercator's Projection. 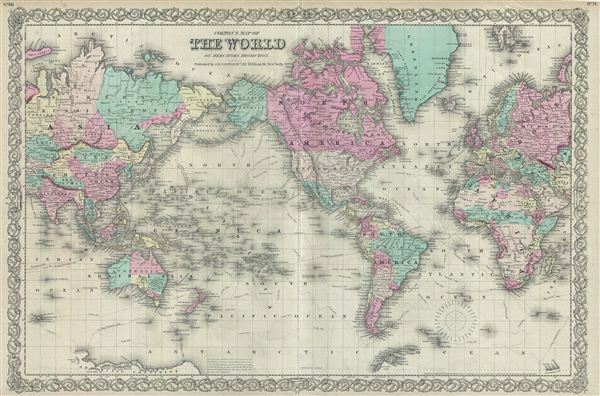 An excellent 1855 first edition example of Colton's map of the World on a Mercator's Projection. This map is a reduction and re-engraving of Colton's important 1848 wall map of the world. Colton offers a fascinating snapshot of the world during a period of rapid globalization and discovery. This map depicts the entire world centered on the Americas. The map identifies the routes taken by various influential late 18th century explorers including Cook, Vancouver, Vincennes, and Perouse. A note at the bottom of the map describes the 1841 discoveries of Mt. Terror and Mt. erebus in Antarctica by Captain Ross. Much of central Africa is described as 'Unexplored Regions,' and both Lake Victoria and Lake Tanganyika have yet to appear. The Antarctic continent is shown only embryonically, representing the relatively primitive state of Antarctic exploration at the time. This map also identifies various cities, towns, rivers, mountains and an assortment of additional topographical details. Map is hand colored in pink, green, yellow and blue pastels to define national and regional boundaries. Surrounded by Colton's typical spiral motif border. Dated and copyrighted to J. H. Colton, 1855. Published from Colton's 172 William Street Office in New York City. Issued as page nos. VIII and IX in volume 2 of Colton's 1856 Atlas of the World. Very good. Blank on verso. Even overall toning. Original centerfold. Rumsey 0149.006 (1856 edition). Phillips (Atlases) 816.